Mel Brooks' office is lined with awards — he's in the elite EGOT club, having won Emmy, Grammy, Oscar and Tony awards. The news peg was TCM's 2018 Classic Film Festival, which launches on Thursday with Brooks' 1968 classic The Producers — his directing debut. In 2001 he turned it into a musical for Broadway. The festival will screen the movie, then TCM's Ben Mankiewicz will interview Brooks onstage. So a few weeks earlier, we went to the Culver Studios to talk with Brooks. His office is small and nicely cluttered. There's an upright piano — in tune. The walls are covered with posters of his films. And there's a shelf jammed with all the Tonys, Emmys and Grammys he has won. ("I'm just mounting it up," he tells me. "I'm going to put it in a box and see what I can get from eBay.") His Oscar is at home, he says, to keep it safe from pilferers. He won it for best original screenplay for The Producers. Despite all the awards, Brooks told me the film almost didn't get made. The story — about producers hoping to get rich from backing a flop with a play called Springtime for Hitler — made every major Hollywood studio nervous. They all turned it down. Producer Joseph E. Levine loved it but urged Brooks to change the title: "Exhibitors will not put Hitler on the marquee," he had said. So the title was changed — but Brooks preserved the laugh by writing the film's theme song, "Springtime for Hitler." As the music plays, skimpily dressed chorus girls parade down a staircase, in bras decorated with puffs of beer foam and golden pretzels. German, see? Dancers in storm trooper uniforms goose-step across the stage. No surprise, there were protests: "Every rabbi in the world sent me a letter," Brooks recalls. And he answered every one: "I said: Listen, get on a soapbox with Hitler, you're gonna lose — he was a great orator. But if you can make fun of him, if you can have people laugh at him, you win." Brooks had trouble with casting. He wanted actor Gene Wilder to play one of the producers, but real producer Levine thought Wilder was funny-looking. "I'll put another $25,000, $50,000 into it but just get a better-looking guy," Levine told him. Brooks won that fight, but he lost his pick to play the Nazi-loving author of the would-be flop play: He wanted Dustin Hoffman, but Hoffman took the leading role of Benjamin in The Graduate instead and was on the road to stardom. Brooks has made a career of poking fun at horrible things: Hitler, racial prejudice, anti-Semitism. He says that's the job. "The comedy writer is like the conscience of the king," he says. "He's got to tell him the truth. And that's my job: to make terrible things entertaining." We ended our chat with smiles and hugs. A visit with Mel Brooks is like sipping a delicious drink — it's sweet and fizzy, and makes you feel marvelous. My sentiments exactly, when we parted. Click the audio link above to hear our conversation. Fifty years ago, Mel Brooks released "The Producers." It was a movie about a scam to put on a Broadway musical that lost money. Years later, it became a Broadway musical about putting on that musical. And like the fictional musical, which was called "Springtime For Hitler," "The Producers" was a hit, famous in its time as the first Broadway show ever to charge $100 for every ticket. 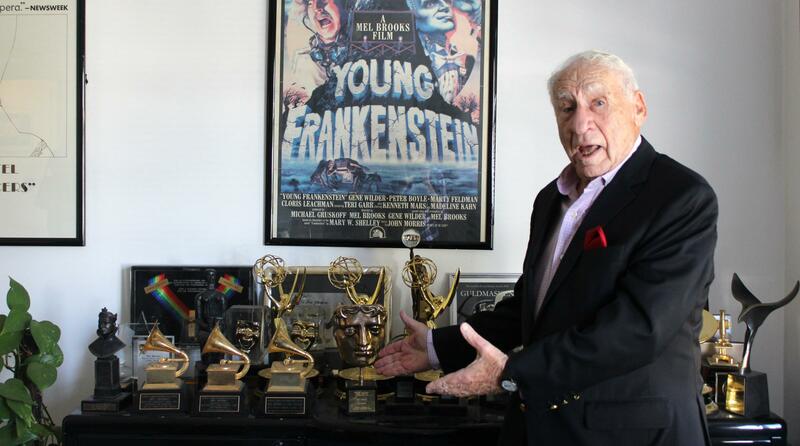 Tomorrow night at the TCM Classic Film Festival in Hollywood, the 91-year-old Mel Brooks will screen the original film. NPR special correspondent Susan Stamberg got a preview of his talk. SUSAN STAMBERG, BYLINE: Mel Brooks' office at Culver Studios is lined with posters of his movies - "Young Frankenstein," "Robin Hood: Men In Tights," "Blazing Saddles." Rows of his awards - Tonys, Emmys, Grammys - line on a shelf. MEL BROOKS: I'm just mounting it all up. I'm going to put it in a box and see what I can get from eBay. BROOKS: He said, I'll do it, but you got to do me one favor - do not call it "Springtime For Hitler" because exhibitors will not put Hitler on the marquee. Call it something else. STAMBERG: Mel did and wrote words and music for a song with the original title. UNIDENTIFIED ACTOR: (As character, singing) Springtime for Hitler and Germany. Deutschland is happy and gay. UNIDENTIFIED ACTORS #1: (As characters, singing) We’re marching to a faster pace. Look out. Here comes the master race. STAMBERG: Director Brooks has chorus girls parade down stairs in this number. They are wearing bras decorated with puffs of beer foam, golden pretzels. Dancers in stormtrooper uniforms goose step across the stage. Mel uses his own voice for one musical passage. BROOKS: (Singing, as character) Don't be stupid. Be a smarty. Come and join the Nazi party. To do a number called "Springtime For Hitler," every rabbi in the world sent me a letter. And I would - I responded to every single one of them, and I said, listen, get on a soapbox with Hitler, you're going to lose. He's a great orator. But if you can make fun of him, if you can have people laugh at him, you win. STAMBERG: So far, so good. Mel had motivation, a producer, a theme song. Now, he needed a cast. Broadway star Zero Mostel turned down the part of ridiculously manipulative, shrewd, money mad producer Max Bialystock, sure that he'd make a fortune on a flop about Hitler by selling each of his backers 100 percent of the show. Zero Mostel's wife intervened. BROOKS: Katie Mostel (ph) read the script, thought it was great and said either you do this or we're divorced. STAMBERG: Then, producer Joseph E. Levine didn't like Mel's pick to play the other producer, actor Gene Wilder. BROOKS: Joe said, you know, Mel, he may be a good actor, I don't know, but he's a funny-looking guy. I'll put in another $25,000, $50,000 into it. Just get a better looking guy. STAMBERG: Mel fought for Gene and won. OK. Gene Wilder as timid, panicky Leopold Bloom. Then there was a problem with the actor he'd cast as Franz Liebkind, the Nazi-loving author of the hoped-for flop "Springtime For Hitler." BROOKS: Actually a guy who lived on my block, Dustin Hoffman. STAMBERG: But - another but - after signing, Hoffman showed up one day at Mel's office. BROOKS: He said, Mel, you can't believe this. I have to go to Hollywood for Mike Nichols to audition for Benjamin in "The Graduate." I said go. Go audition. You're a mutt. They're going to look at you, and they're going to say, are you crazy, this short, funny-looking guy. So I said, I'm not worried. Dustin, I'm not worried. STAMBERG: Well, he should have been. "The Graduate" launched Hoffman's career, playing opposite Mel's wife, Anne Bancroft. You get us laughing at things that make us feel naughty to laugh at. STAMBERG: Yeah because they're so outrageous. It's too horrible. How can he poke fun at it? I think that's what goes on inside. BROOKS: Well, that's the job. The comedy writer is like the conscience of the king. He's got to tell them the truth. And that's my job, to make terrible things entertaining. STAMBERG: So in his films, Mel Brooks pokes fun at racial prejudice, the infirmities of old people, the Inquisition with its tortures and murders and, especially in "The Producers," anti-Semitism. UNIDENTIFIED ACTORS #1: (As characters, singing) Bombs falling from the skies again, Deutschland is on the rise again. STAMBERG: Four years ago, Mel Brooks joined a roster of movie legends - Fred Astaire, Judy Garland, Marilyn Monroe. Like them, he pressed his hand and footprints into wet cement in front of the Chinese Theatre on Hollywood Boulevard. Mel was thrilled to be asked, but he knew his fans would want to see something rapscalliony (ph). BROOKS: So I called somebody at Fox and I said, look, you guys are brilliant. Can you make me another finger? STAMBERG: Well, who could turn down Mel Brooks? BROOKS: They built me another pinky, you know? So I had six fingers on one hand. BROOKS: Saying, Clara (ph) come over here. I don't believe it. Look. Mel Brooks had six fingers on his right hand, you know. That's why I did it, to be me. UNIDENTIFIED ACTORS #2: (As characters, singing) Prisoners of love, blue skies above 'cause we're still prisoners of love. STAMBERG: Oh, the fate of the flop - the producers go to jail where they cast inmates in a new show, "Prisoners Of Love." The inmates invest, so does the warden. GENE WILDER: (As Leopold Bloom) Tell him he owns 50 percent of the show. UNIDENTIFIED ACTORS #2: (As characters, singing) Prisoners of love, blue skies above, can't keep our hearts in jail. Transcript provided by NPR, Copyright NPR.